Last weekend was my parents-in-law’s 40th anniversary party. We had a small family party/dinner in the private dining room of a local Italian restaurant. The restaurant was amazing with regards to the food – they accomodated us with a nice starter and an incredible gluten-free, vegan main course. They were, however, not up to making a vegan dessert. In fact, I didn’t even suggest it as I find that in situations like this, the vegans end up with a beautifully decorated fruit platter. Not that I’m against fruit platters…but a fruit platter is not exactly what I call DESSERT. So I asked if the non-vegans could order desserts off the menu and if I could bring along a vegan dessert that the restaurant could serve us. The manager happily agreed to it:) I was torn whether to make one of my tried and tested recipes or to try a new one. I LOVE trying new recipes so I ended up doing just that and trying this amazing recipe from Emily. 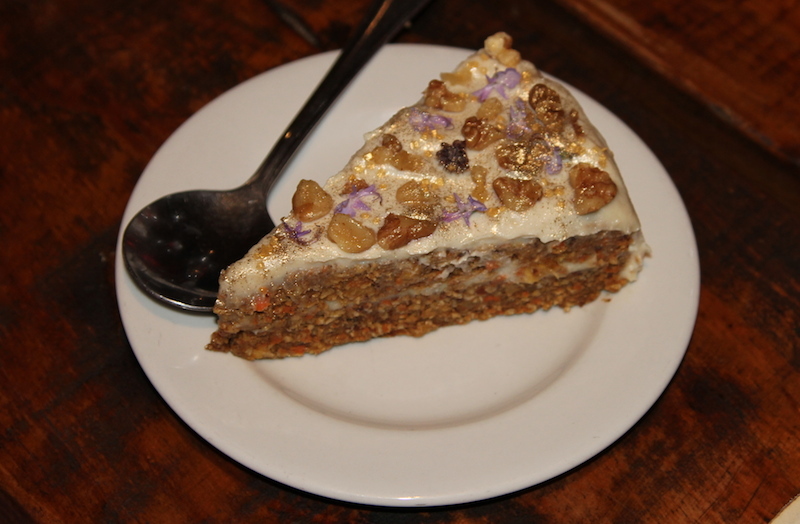 I have never had a raw carrot cake before and was a little skeptical at first, but it is really delicious. 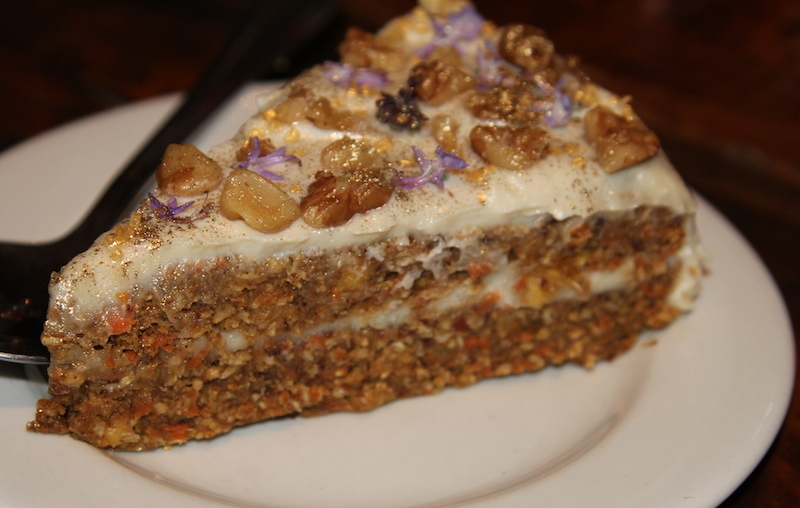 No, obviously it does not taste exactly like a baked carrot cake – it is a raw carrot cake! But in it’s own right, it is delicious. I grated the carrots and then proceeded to make the batter just as Emily directs. I just found that the batter wasn’t sticky enough or sweet enough so I added more dates until it reached the desired texture and taste. The sweetness and moisture content of dates and carrots varies, so use your discretion and don’t be scared to add more of something if it is needed. I made the icing as she stated but found it was not flavourful enough for me. I added quite a bit more agave and loads more lemon juice (bottled juice), until it tasted LEGENDARY! I was literally licking out the bowl! So if the icing tastes bland at first, keep adding your sweetener until it is sweet enough and then add more lemon juice until it suits your taste. Don’t give up on it -it is worth playing with it until it is perfect! 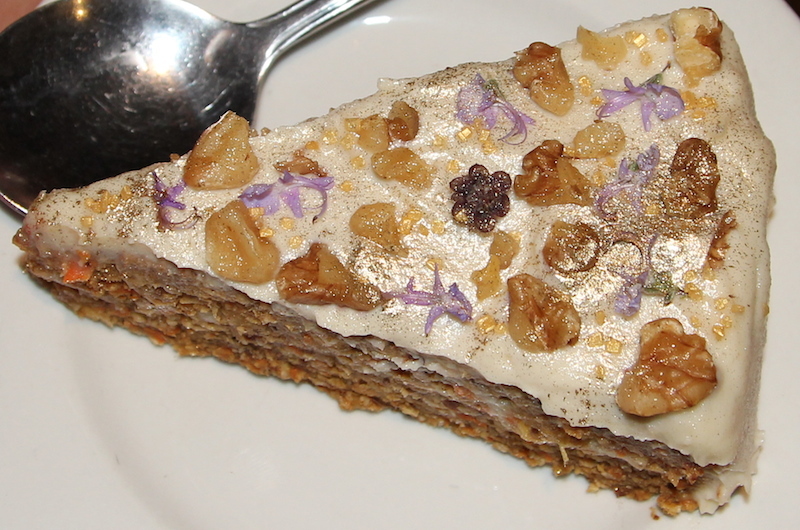 I then cut off some basil and rosemary flowers from my herb garden to scatter on the cake, along with walnut bits and gold edible glitter. Mom says she wants to make this, hope we survive!